Who is your child talking to? Child Sexual Exploitation (CSE) is closer than you think. Havering Council is supporting national CSE Awareness Day on Sunday 18 March. 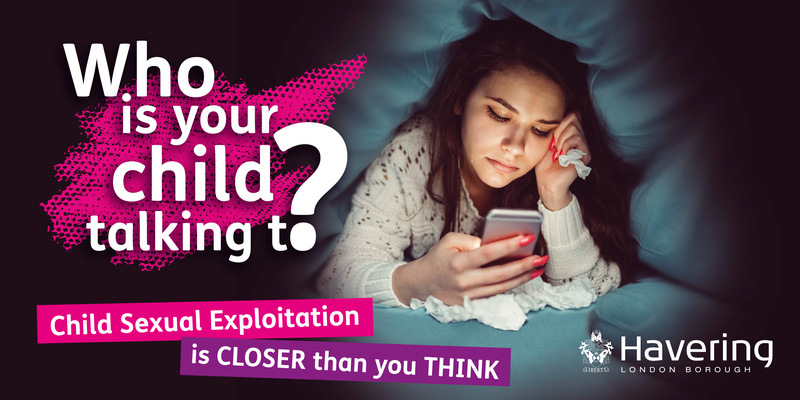 We hope to raise awareness amongst parents and carers that CSE is impacting more and more children across London, and inform parents that this can sadly start whilst their child is at home on their phone, tablet or computer. CSE can take many forms from peer-on-peer exploitation, sexual bullying, to inappropriate relationships with older boyfriends or girlfriends. A young person may not even realise that they are being exploited, but through their peers, older boyfriend or girlfriend they are being persuaded to post inappropriate images of themselves or engage in sexual acts that makes them feel uncomfortable. “The Council is committed to preventing child sexual exploitation. We are working with theatre companies and also working with the BRECK Foundation, visiting schools throughout the borough, to raise awareness of potential online dangers.